A senior Russian Orthodox Church official says he met with U.S. Vice President Mike Pence and told him that the United States and Russia should fight terrorism together. 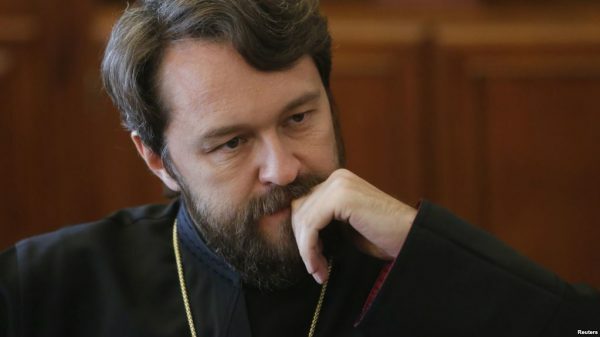 Metropolitan Hilarion, head of the Russian church’s External Relations Department, said he spoke with Pence for a few minutes ahead of the World Summit in Defense of Persecuted Christians, which they both attended in Washington on May 11. Hilarion’s remarks were in line with repeated statements by Russian officials, who have long accused the United States of applying double standards in its fight against terrorism and urged closer cooperation. The United States rejects the allegations. President Donald Trump has voiced the hope that the two countries can cooperate more closely against Islamic State (IS) and other extremist groups, and the issue has been a major focus of conversations between Trump and Russian President Vladimir Putin. But there have been few signs of increase cooperation and the two countries are conducting separate air strike campaigns in Syria. U.S. official say the Russian operations have mainly targeted armed opponents of Syrian President Bashar al-Assad’s government rather than IS.